For other uses, see Christian. Christians (/ˈkrɪstʃən, -tiən/ ( listen)) are people who follow or adhere to Christianity, a monotheistic Abrahamic religion based on the life and teachings of Jesus Christ. The words Christ and Christian derive from the Koine Greek title Christós (Χριστός), a translation of the Biblical Hebrew term mashiach (מָשִׁיחַ). 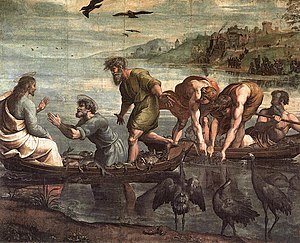 After the miraculous catch of fish, Christ invokes his disciples to become "fishers of men" (Matthew 4:19) by Raphael. While there are diverse interpretations of Christianity which sometimes conflict, they are united in believing that Jesus has a unique significance. The term "Christian" is also used as an adjective to describe anything associated with Christianity, or in a proverbial sense "all that is noble, and good, and Christ-like." According to a 2011 Pew Research Center survey, there were 2.2 billion Christians around the world in 2010, up from about 600 million in 1910. By 2050, the Christian population is expected to exceed 3 billion. According to a 2012 Pew Research Center survey Christianity will remain the world's largest religion in 2050, if current trends continue. Today, about 37% of all Christians live in the Americas, about 26% live in Europe, 24% live in sub-Saharan Africa, about 13% live in Asia and the Pacific, and 1% live in the Middle East and North Africa. About half of all Christians worldwide are Catholic, while more than a third are Protestant (37%). Orthodox communions comprise 12% of the world's Christians. Other Christian groups make up the remainder. Christians make up the majority of the population in 158 countries and territories. 280 million Christians live as a minority. The Greek word Χριστιανός (Christianos), meaning "follower of Christ", comes from Χριστός (Christos), meaning "anointed one", with an adjectival ending borrowed from Latin to denote adhering to, or even belonging to, as in slave ownership. In the Greek Septuagint, christos was used to translate the Hebrew מָשִׁיחַ (Mašíaḥ, messiah), meaning "[one who is] anointed." In other European languages, equivalent words to Christian are likewise derived from the Greek, such as Chrétien in French and Cristiano in Spanish. The abbreviations Xian and Xtian (and similarly-formed other parts of speech) have been used since at least the 17th century: Oxford English Dictionary shows a 1634 use of Xtianity and Xian is seen in a 1634-38 diary. The word Xmas uses a similar contraction. The first recorded use of the term (or its cognates in other languages) is in the New Testament, in Acts 11:26, after Barnabas brought Saul (Paul) to Antioch where they taught the disciples for about a year, the text says: "[...] the disciples were called Christians first in Antioch." The second mention of the term follows in Acts 26:28, where Herod Agrippa II replied to Paul the Apostle, "Then Agrippa said unto Paul, Almost thou persuadest me to be a Christian." The third and final New Testament reference to the term is in 1 Peter 4:16, which exhorts believers: "Yet if [any man suffer] as a Christian, let him not be ashamed; but let him glorify God on this behalf." Kenneth Samuel Wuest holds that all three original New Testament verses' usages reflect a derisive element in the term Christian to refer to followers of Christ who did not acknowledge the emperor of Rome. 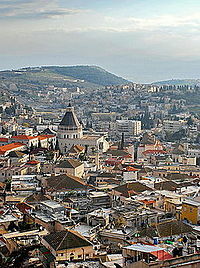 The city of Antioch, where someone gave them the name Christians, had a reputation for coming up with such nicknames. However Peter's apparent endorsement of the term led to its being preferred over "Nazarenes" and the term Christianoi from 1 Peter becomes the standard term in the Early Church Fathers from Ignatius and Polycarp onwards. The earliest occurrences of the term in non-Christian literature include Josephus, referring to "the tribe of Christians, so named from him;" Pliny the Younger in correspondence with Trajan; and Tacitus, writing near the end of the 1st century. In the Annals he relates that "by vulgar appellation [they were] commonly called Christians" and identifies Christians as Nero's scapegoats for the Great Fire of Rome. Another term for Christians which appears in the New Testament is "Nazarenes". Jesus is named as a Nazarene in Math 2:23, while Saul-Paul is said to be Nazarene in Acts 24:5. The latter verse makes it clear that Nazarene also referred to the name of a sect or heresy, as well as the town called Nazareth. The term Nazarene was also used by the Jewish lawyer Tertullus (Against Marcion 4:8) which records that "the Jews call us Nazarenes." While around 331 AD Eusebius records that Christ was called a Nazoraean from the name Nazareth, and that in earlier centuries "Christians" were once called "Nazarenes". The Hebrew equivalent of "Nazarenes", Notzrim, occurs in the Babylonian Talmud, and is still the modern Israeli Hebrew term for Christian. Linda Woodhead attempts to provide a common belief thread for Christians by noting that "Whatever else they might disagree about, Christians are at least united in believing that Jesus has a unique significance." Michael Martin evaluated three historical Christian creeds (the Apostles' Creed, the Nicene Creed and the Athanasian Creed) to establish a set of basic Christian assumptions which include belief in theism, the historicity of Jesus, the Incarnation, salvation through faith in Jesus, and Jesus as an ethical role model. The identification of Jesus as the Messiah is not accepted by Judaism. The term for a Christian in Hebrew is נוֹצְרִי (Notzri—"Nazarene"), a Talmudic term originally derived from the fact that Jesus came from the Galilean village of Nazareth, today in northern Israel. Adherents of Messianic Judaism are referred to in modern Hebrew as יְהוּדִים מְשִׁיחִיִּים (Yehudim Meshihi'im—"Messianic Jews"). In Arabic-speaking cultures, two words are commonly used for Christians: Naṣrānī (نصراني), plural Naṣārā (نصارى) is generally understood to be derived from Nazareth through the Syriac (Aramaic); Masīḥī (مسيحي) means followers of the Messiah. Where there is a distinction, Nasrani refers to people from a Christian culture and Masihi is used by Christians themselves for those with a religious faith in Jesus. In some countries Nasrani tends to be used generically for non-Muslim Western foreigners, e.g. "blond people." Another Arabic word sometimes used for Christians, particularly in a political context, is Ṣalībī (صليبي "Crusader") from ṣalīb (صليب "cross"), which refers to Crusaders and has negative connotations. However, Ṣalībī is a modern term; historically, Muslim writers described European Christian Crusaders as al-Faranj or Alfranj (الفرنج) and Firinjīyah (الفرنجيّة) in Arabic. This word comes from the name of the Franks and can be seen in the Arab history text Al-Kamil fi al-Tarikh by Ali ibn al-Athir. The most common Persian word is Masīhī (مسیحی), from Arabic. Other words are Nasrānī (نصرانی), from Syriac for "Nazarene", and Tarsā (ترسا), from Middle Persian word Tarsāg, also meaning "Christian", derived from tars, meaning "fear, respect". An old Kurdish word for Christian frequently in usage was felle (فەڵە), coming from the root word meaning "to be saved" or "attain salvation". The Syriac term Nasrani (Nazarene) has also been attached to the Saint Thomas Christians of Kerala, India. In the Indian subcontinent, Christians call themselves Isaai (Hindi: ईसाई, Urdu: عیسائی‎), and are also known by this term to adherents of other religions. This is related to the name they call Jesus, 'Isa Masih, and literally means 'the followers of 'Isa'. In the past, the Malays used to call the Portuguese Serani from the Arabic Nasrani, but the term now refers to the modern Kristang creoles of Malaysia. In Indonesian language, the term "Nasrani" is also used alongside with "Kristen". The Chinese word is 基督徒 (pinyin: jīdū tú), literally "Christ follower." The two characters now pronounced Jīdū in Mandarin Chinese were originally used phonetically to represent the name of Christ. In Vietnam, the same two characters read Cơ đốc, and a "follower of Christianity" is a tín đồ Cơ đốc giáo. In Japan, the term kirishitan (written in Edo period documents 吉利支丹, 切支丹, and in modern Japanese histories as キリシタン), from Portuguese cristão, referred to Roman Catholics in the 16th and 17th centuries before the religion was banned by the Tokugawa shogunate. 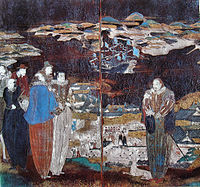 Today, Christians are referred to in Standard Japanese as キリスト教徒, Kirisuto-kyōto or the English-derived term クリスチャン kurisuchan. Korean still uses 기독교도, Kidok-kyo-do for "Christian", though the Greek form Kurisudo 그리스도 has now replaced the old Sino-Korean Kidok, which refers to Christ himself. In Thailand, the most common terms are คนคริสต์ (khon khrit) or ชาวคริสต์ (chao khrit) which literally mean "Christ person/people" or "Jesus person/people." The Thai word คริสต์ (khrit) is derived from "Christ." The region of modern Eastern Europe and Central Eurasia (Russia, Ukraine and other countries of the former Soviet bloc) has a long history of Christianity and Christian communities on its lands. In ancient times, in the first centuries after the birth of Christ, when this region was called Scythia, the geographical area of Scythians - Christians already lived there. Later the region saw the first states to adopt Christianity officially - initially Armenia (301 AD) and Georgia (337 AD), later Bulgaria (c. 864) and the Great Russian Principality (Kyivan Rus, Russian: Великое княжество Русское, c. 988 AD). In some areas, people of that time[when?] came to denote themselves as Christians (Russian: христиане, крестьяне) and as Russians (Russian: русские). Both terms had strong Christian connotations. In time the Russian term "крестьяне" (khrest'yanye) acquired the meaning "peasants of Christian faith" and later "peasants" (the main part of the population of the region), while the term "христиане" (khristianye) retained its religious meaning and the term "русские" (russkiye) began to mean representatives of the heterogeneous Russian nation formed on the basis of common Christian faith and language, which strongly influenced the history and development of the region. In the region the term "Pravoslav faith" (Russian: православная вера - Orthodox faith) or "Russian faith" (Russian: русская вера) from earliest times became almost as known as the original "Christian faith" (христианская, крестьянская вера). Also in some contexts the term "cossack" (Russian: козак, казак - "free man" by the will of God) was used[by whom?] to denote "free" Christians of steppe origin and Russian language. Nominally "Christian" societies made "Christian" a default label for citizenship or for "people like us". In this context, religious or ethnic minorities can use "Christians" or "you Christians" loosely as a shorthand term for mainstream members of society who do not belong to their group - even in a thoroughly secular (though formerly Christian) society. For a detailed breakdown of Christian demographics, see Christianity by country. As of the early 21st century, Christianity has approximately 2.4 billion adherents. The faith represents about a third of the world's population and is the largest religion in the world. Christians have composed about 33 percent of the world's population for around 100 years. The largest Christian denomination is the Roman Catholic Church, with 1.17 billion adherents, representing half of all Christians. Christianity remains the dominant religion in the Western World, where 70% are Christians. According to a 2012 Pew Research Center survey, if current trends continue, Christianity will remain the world's largest religion by the year 2050. By 2050, the Christian population is expected to exceed 3 billion. While Muslims have an average of 3.1 children per woman—the highest rate of all religious groups, Christians are second, with 2.7 children per woman. High birth rates and conversion were cited as the reason for Christian population growth. A 2015 study found that approximately 10.2 million Muslims converted to Christianity. Christianity is growing in Africa, Asia, Latin America, the Muslim world, and Oceania. A Pew Center study about religion and education around the world in 2016, found that Christians ranked as the second most educated religious group around in the world after Jews with an average of 9.3 years of schooling, and the highest numbers of years of schooling among Christians were found in Germany (13.6), New Zealand (13.5) and Estonia (13.1). Christians were also found to have the second highest number of graduate and post-graduate degrees per capita while in absolute numbers ranked in the first place (220 million). Between the various Christian communities, Singapore outranks other nations in terms of Christians who obtain a university degree in institutions of higher education (67%), followed by the Christians of Israel (63%), and the Christians of Georgia (57%). According to the study, Christians in North America, Europe, Middle East, North Africa and Asia Pacific regions are highly educated since many of the world universities were built by the historic Christian Churches, in addition to the historical evidence that "Christian monks built libraries and, in the days before printing presses, preserved important earlier writings produced in Latin, Greek and Arabic". According to the same study, Christians have a significant amount of gender equality in educational attainment, and the study suggests that one of the reasons is the encouragement of the Protestant Reformers in promoting the education of women, which led to the eradication of illiteracy among females in Protestant communities. Christians have made noted contributions to a range of fields, including philanthropy, philosophy,:15 ethics, literature, business and economics, fine arts and architecture, music, theatre and medicine, as well as science and technology, both historically and in modern times. Eastern Christians (particularly Nestorian Christians) contributed to the Arab Islamic Civilization during the Ummayad and the Abbasid periods by translating works of Greek philosophers to Syriac and afterwards to Arabic. They also excelled in philosophy, science, theology and medicine. ^ a b c d e f g h i j k l m n o p q r s t u ANALYSIS (19 December 2011). "Global Christianity". Pewforum.org. Retrieved 17 August 2012. ^ "Discrimination in the EU in 2012" (PDF), Special Eurobarometer, 383, European Union: European Commission, p. 233, 2012, retrieved 14 August 2013 The question asked was "Do you consider yourself to be...?" With a card showing: Catholic, Orthodox, Protestant, Other Christian, Jewish, Muslim, Sikh, Buddhist, Hindu, Atheist, and Non-believer/Agnostic. Space was given for Other (SPONTANEOUS) and DK. Jewish, Sikh, Buddhist, Hindu did not reach the 1% threshold. ^ Johnson, Todd M.; Grim, Brian J. (2013). The World's Religions in Figures: An Introduction to International Religious Demography (PDF). Hoboken, NJ: Wiley-Blackwell. p. 10. Archived from the original (PDF) on 20 October 2013. Retrieved 24 November 2015. ^ Wilken, Robert Louis. The First Thousand Years: A Global History of Christianity. New Haven and London: Yale University Press. p. 26. ISBN 978-0-300-11884-1. ^ Bickerman (1949) p. 145, The Christians got their appellation from "Christus," that is, "the Anointed," the Messiah. ^ a b c Woodhead, Linda (2004). Christianity: A Very Short Introduction. Oxford: Oxford University Press. pp. n.p. ^ Beal, Timothy (2008). Religion in America: A Very Short Introduction. Oxford: Oxford University Press. pp. 35, 39. Beal states that, "Although all of them have their historical roots in Christian theology and tradition, and although most would identify themselves as Christian, many would not identify others within the larger category as Christian. Most Baptists and Fundamentalists, for example, would not acknowledge Mormonism or Christian Science as Christian. In fact, the nearly 77 percent of Americans who self-identify as Christian are a diverse pluribus of Christianities that are far from any collective unity." ^ Schaff, Philip. "V. St. Paul and the Conversion of the Gentiles (Note 496)". History of the Christian Church. ^ a b c d E. McGrath, Alister (2006). Christianity: An Introduction. John Wiley & Sons. p. 336. ISBN 1405108991. Virtually every major European composer contributed to the development of church music. Monteverdi, Haydn, Mozart, Beethoven, Rossini, and Verdi are all examples of composers to have made significant contributions in this sphere. The Catholic church was without question one of the most important patrons of musical developments, and a crucial stimulus to the development of the western musical tradition. ^ Baruch A. Shalev, 100 Years of Nobel Prizes (2003), Atlantic Publishers & Distributors, p.57: between 1901 and 2000 reveals that 654 Laureates belong to 28 different religion Most (65.4%) have identified Christianity in its various forms as their religious preference. ^ Bickerman, 1949 p. 147, All these Greek terms, formed with the Latin suffix -ianus, exactly as the Latin words of the same derivation, express the idea that the men or things referred to, belong to the person to whose name the suffix is added. p. 145, In Latin this suffix produced proper names of the type Marcianus and, on the other hand, derivatives from the name of a person, which referred to his belongings, like fundus Narcissianus, or, by extension, to his adherents, Ciceroniani. ^ Rogers, Samuel (2004). Webster, Tom; Shipps, Kenneth W. (eds.). The Diary of Samuel Rogers, 1634-1638. Boydell Press. p. 4. ISBN 9781843830436. Retrieved 8 January 2019. Throughout his diary, Rogers abbreviates 'Christ' to 'X' and the same is true of 'Christian' ('Xian'), 'Antichrist' ('AntiX') and related words. ^ #Wuest-1973 p. 19. The word is used three times in the New Testament, and each time as a term of reproach or derision. Here in Antioch, the name Christianos was coined to distinguish the worshippers of the Christ from the Kaisarianos, the worshippers of Caesar. ^ #Wuest-1973 p. 19. The city of Antioch in Syria had a reputation for coining nicknames. ^ Christine Trevett Christian women and the time of the Apostolic Fathers 2006 "'Christians' (christianoi) was a term first coined in Syrian Antioch (Acts 11: 26) and which appeared next in Christian sources in Ignatius, Eph 11.2; Rom 3.2; Pol 7.3. Cf. too Did 12.4; MPol 3.1; 10.1; 12.1-2; EpDiog 1.1; 4.6; 5.1;"
^ Josephus. "Antiquities of the Jews — XVIII, 3:3". ^ Tacitus, Cornelius; Murphy, Arthur (1836). The works of Cornelius Tacitus: with an essay on his life and genius, notes, supplements, &c. Thomas Wardle. p. 287. ^ Bruce, Frederick Fyvie (1988). The Book of the Acts. Eerdmans. p. 228. ISBN 0-8028-2505-2. ^ Bulletin of the School of Oriental and African Studies: Volume 65, Issue 1 University of London. School of Oriental and African Studies - 2002 "... around 331, Eusebius says of the place name Nazareth that 'from this name the Christ was called a Nazoraean, and in ancient times we, who are now called Christians, were once called Nazarenes';6 thus he attributes this designation ..."
^ Beal, Timothy (2008). Religion in America: A Very Short Introduction. Oxford: Oxford University Press. p. 35. ^ Martin, Michael (1993). The Case Against Christianity. Temple University Press. p. 12. ISBN 1-56639-081-8. ^ a b Society for Internet Research, The Hamas Charter, note 62 (erroneously, "salidi"). ^ Jeffrey Tayler, Trekking through the Moroccan Sahara. ^ "Nasara". Mazyan Bizaf Show. ^ Akbar S. Ahmed, Islam, Globalization, and Postmodernity, p 110. ^ Hazhar Mukriyani, (1990) Hanbanaborina Kurdish-Persian Dictionary Tehran, Soroush press p.527. ^ "Catholic priest in saffron robe called 'Isai Baba'". The Indian Express. December 24, 2008. Archived from the original on January 13, 2012. ^ Compare: Cross, Frank Leslie; Livingstone, Elizabeth A., eds. (1957). "Christian". The Oxford Dictionary of the Christian Church (3 ed.). Oxford: Oxford University Press (published 2005). p. 336. ISBN 9780192802903. Retrieved 2016-12-05. In modern times the name Christian [...] has tended, in nominally Christian countries, to lose any credal significance and imply only that which is ethically praiseworthy (e.g. 'a Christian action') or socially customary ('Christian name'). ^ Compare: Sandmel, Samuel (1967). We Jews and You Christians: An Inquiry Into Attitudes. Lippincott. Retrieved 2016-12-06. ^ 33.39% of 7.174 billion world population (under "People and Society") "World". CIA world facts. ^ "The List: The World's Fastest-Growing Religions". foreignpolicy.com. March 2007. Retrieved 2010-01-04. ^ Pontifical Yearbook 2010, Catholic News Agency. Accessed September 22, 2011. ^ "Study: Christianity growth soars in Africa – USATODAY.com". USATODAY.COM. 20 December 2011. Retrieved 14 February 2015. ^ a b c d e f g h i j k "Religion and Education Around the World" (PDF). Pew Research Center. December 19, 2011. Retrieved December 13, 2016. ^ Ernst, Troeltsch (2017). Protestantism and Progress: A Historical Study of the Relation of Protestantism to the Modern World. Routledge. p. 80. ISBN 1351496115. ...It is clear enough without this that the contribution of Protestantism to modern economic development, which is, in point of fact, one of the most characteristic features of our modern world, is to be ascribed, not to Protestantism as a whole, but primarily to Calvinism, Pietism, and the Sectaries, and that even with them this contribution is only an indirect and consequently an involuntary one. ^ What Christianity Has Done for the World. Rose Publishing Inc. 2014. ISBN 1628621060. Christian, also contributed much to the world of music. A prolific composer, Bach regularly wrote sacred music, dedicating his efforts to the glory of God. Wuest, Kenneth Samuel (1973). Wuest's word studies from the Greek New Testament. 1. ISBN 978-0-8028-2280-2.